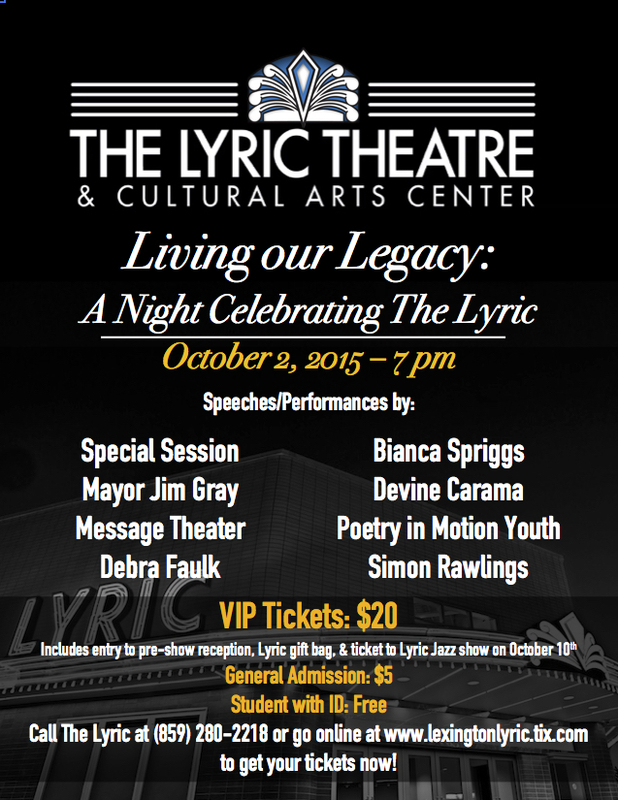 The Lyric Theatre & Cultural Arts Center welcomes all to celebrate in our five year anniversary on Friday, October 2nd at 7:00 pm during 'Living our Legacy: A Night Celebrating The Lyric'. It has been many years since The Lyric was originally opened in 1948, and much has changed both for The Lyric and the neighborhood and city surrounding it. Five years have passed since 2010 The Lyric Task Force and supporting members of the community successfully strove to reopen the old East End theatre as The Lyric Theatre & Cultural Arts Center, with the goal to preserve, promote, present and celebrate diverse cultures with special influence on African American cultural heritage through artistic presentations of the highest quality, education programming and outreach, film, and opportunities for community inclusion. 'Living our Legacy' not only celebrates the ongoing progress and growth of The Lyric in the last five years, but the shared history we as a community have in this establishment and how much we have grown together. VIP Tickets: Come at 6:00 pm and treat yourself to a red carpet entrance in your best after 5 attire and enjoy an open house of The Lyric to explore our exhibits and gorgeous facility. Each ticket includes heavy h'orderves and cash bar from Selma's Catering. At 7:00 pm, we will invite our guests into the theater for a special one-time performance by Message Theater acting troupe. We will hear from special guests Bianca Spriggs, Special Sessions and many more, and after, hold a special ceremony to thank the groups and individuals who forged the path of The Lyric's reopening. This special night is presented in conjunction with the Lyric's Theatre & Cultural Art Center's 5 Year Anniversary during the month of October, in which we will host multiple events, performances and and activities to celebrate our history in the community, our growth, and our achievements with all of our supporters, neighbors and friends.